We’d love your help. Let us know what’s wrong with this preview of Labyrinths by Catrine Clay. Emma Jung was clever, ambitious and immensely wealthy, one of the richest heiresses in Switzerland when, aged seventeen, she met and fell in love with Carl Jung, a handsome, penniless medical student. Determined to share his a The story of Emma and Carl Jung's highly unconventional marriage, their relationship with Freud, and their part in the early years of Psychoanalysis. Description: The story of Emma Jung, her marriage to Carl and the early years of psychoanalysis. Emma Jung was clever, ambitious and immensely wealthy, one of the richest heiresses in Switzerland, when she met and fell in love with Carl Jung, a handsome but penniless medical student. She was only 17, too young to understand Carl's complex personality or conceive of the dramas that lay ahead. Emma Rauschenbach Jung was one of the wealthiest women in Switzerland and Carl Jung was among the poorest men. After her marriage at a young age, Emma provided Carl with an elegant lifestyle and became his colleague. She performed analysis, wrote papers and was President of the Psychological Society (which sounds like a resort where papers were presented and ideas shared) in Zurich. What could have been dynamic picture book marriage was marred by Carl’s “rages” and infidelities. The author begins Emma Rauschenbach Jung was one of the wealthiest women in Switzerland and Carl Jung was among the poorest men. After her marriage at a young age, Emma provided Carl with an elegant lifestyle and became his colleague. She performed analysis, wrote papers and was President of the Psychological Society (which sounds like a resort where papers were presented and ideas shared) in Zurich. What could have been dynamic picture book marriage was marred by Carl’s “rages” and infidelities. The author begins with a compelling scene where the Jung’s visit the Freud’s for a family dinner. After this, The narrative goes back to Emma’s and Carl’s childhoods and the timeline stays linear, The interesting prose that describes the dinner with the Freud’s does not recur. You learn of Emma’s family’s decision that she not be educated, her interest in the legend of the Holy Grail, her “wedding”, her early married life at the Burgholzli asylum, how she and Carl designed and built their state-of-the-art home (flush toilets and electricity), had 5 children, enjoyed family life while coping with Carl’s “rages”, tolerated of Jung’s female “guests”, and how she became an analyst, wrote papers, gave lectures and traveled. There is a good description of daily life in Switzerland during WWI. The author presents a lot of information, but it seemed more like a series of events than a portrait. In the end, I didn’t feel that I knew either Emma or her “labyrinth”. “Labyrinths” was well received when published in England this summer. Yet throughout the first half of the book, no matter how much I squinted, I could not discern why. The subject is rich, definitely, and Jungian analysis has a groovy, woo-woo sort of appeal. But Ms. Clay’s sourcing is thin. She devotes pages of filler to the glorious architecture of Middle Europe — sounding uncomfortably close to the sales pitch for a Viking River Cruise — and to the menu at the Jungs’ wedding, and to the wares of the Bahnhofstrasse, and to the costume of the day. ... It all seems a clumsy attempt at trompe l’oeil, to give the illusion of depth. // My l’oeil wasn’t tromped. Born in 1882, Emma Rauschenbach was "one of the richest heiresses in Switzerland" (3). Clever and ambitious, Emma always wanted to study the natural sciences at the University of Zurich, but was discouraged because of her family's desire for her to follow the dictates of Swiss society that decreed that she must prepare for marriage. However, her mother did encourage Emma to marry Carl Jung, "the son of a poor pastor of the Swi I received an uncorrected proof copy of this book from HarperCollins. Born in 1882, Emma Rauschenbach was "one of the richest heiresses in Switzerland" (3). Clever and ambitious, Emma always wanted to study the natural sciences at the University of Zurich, but was discouraged because of her family's desire for her to follow the dictates of Swiss society that decreed that she must prepare for marriage. However, her mother did encourage Emma to marry Carl Jung, "the son of a poor pastor of the Swiss Protestant Reformed Church" (3). Carl was just embarking on a career as a doctor for the insane, which was regarded as the lowest rung in the medical profession. It was an odd choice for a wealthy young woman, but Emma was intrigued by her husband's profession and from very early in their marriage assisted him closely with his professional work. More than a biography of Emma Jung, this is truly a portrait of a marriage, one that was complex and full of both hardships and love. Carl seems to have been a difficult husband. Clay describes him as having a split personality that Carl himself referred to as "Personality No 1" and "Personality No 2;" the two differed in nearly every way: "sure and unsure, optimistic and pessimistic, introverted and extroverted, sensitive and insensitive, brilliant yet obtuse, genial yet given to violent rages, cold under warm, dark under light - always split, and that split always hidden. Secret" (26-27). The vastly variable versions of her husband made their home life difficult throughout their over fifty years of marriage. Emma too struggled, primarily with the strictures placed on a wife and mother, as their eventual five children together kept her largely at home while her husband was still free to pursue his intellectual pursuits. Another major point of contention in the marriage was Carl's insistence on the need for their marriage to be "polygamous" or an open marriage, in which he brazenly flaunted his infatuations (often with patients) and mistresses in front of his faithful wife. Throughout all of their struggles, the internationally renowned work in psychoanalysis made famous by Jung would likely not have happened without Emma's quiet presence in the background. "Without Emma keeping the steady rhythm of family life going he might have cracked" (214). Emma was also a huge support to her husband professionally, helping him keep up with patients, correspondence, and paperwork during his many travels. In nearly every way, theirs was a "joint career" (320). През 1899 едва седемнайсетгодишната Ема Раушенбах, една от най-богатите наследници в Швейцария, се влюбва в Карл Юнг, беден Irrenarz (лекар, грижещ се за душевноболни) – най-неуважаваната медицинска дисциплина. Родителите на Ема насърчават любовната й връзка с доктор Юнг. Искат тя да е щастлива, освен това въпреки плебейския си произход и непрестижната си професия Карл е много интелигентен и трудолюбив. Никой не подозира колко далеч ще стигне този свръхамбициозен млад човек, когото самият Фройд През 1899 едва седемнайсетгодишната Ема Раушенбах, една от най-богатите наследници в Швейцария, се влюбва в Карл Юнг, беден Irrenarz (лекар, грижещ се за душевноболни) – най-неуважаваната медицинска дисциплина. Родителите на Ема насърчават любовната й връзка с доктор Юнг. Искат тя да е щастлива, освен това въпреки плебейския си произход и непрестижната си професия Карл е много интелигентен и трудолюбив. More about Carl and Sigmund than Emma. But an interesting lens at times. Interesting, but dull. I listened to the audio-version and I often found my mind wondering while listening. There have been numerous biographies of Carl Jung. The only one I had previously read was his autobiography, so I found Labyrinths to be particularly useful in filling in the gaps in my knowledge of the subject. I was disappointed that I didn't gain enough of an insight into Emma Jung's life. There didn't seem to be a lot of detailed information about her. I think that this shows how considerably she was overshadowed by her husband, and also points out the minimal role of women in most profession There have been numerous biographies of Carl Jung. The only one I had previously read was his autobiography, so I found Labyrinths to be particularly useful in filling in the gaps in my knowledge of the subject. I was disappointed that I didn't gain enough of an insight into Emma Jung's life. There didn't seem to be a lot of detailed information about her. I think that this shows how considerably she was overshadowed by her husband, and also points out the minimal role of women in most professions in those days. It was a slower read than I had anticipated. 3 JAN 2017 - a recommendation through Bettie. Many Thanks! Another from Audible, a very interesting book. And funnily enough takes place around the time of the first world war(not intentional). It's well researched and includes many excellent insights into the minds of Jung and Emma. I think I'm going to have to go through it a couple of more times. As I haven't quite decided on my opinion of Jung and Emma. The is a good introduction and worth the read. Изключително леко се чете. Препоръчвам на всекиго, който желае да се запознае по-отблизо с жената до Личност 1 и Личност 2 (същностите на Карл Юнг). Оказа се, че клишето "зад всеки успял мъж стои една силна жена" и тук важи в пълна мяра. Липсват ми само бележките под линия - единственият сериозен минус на книгата. Затова поставям 4 звезди. This book did not give me the insight into Emma Jung that I was hoping for. The writing felt scattered and repetitive. That being said, at times it was an interesting read and I did learn some about Emma and Carl's marriage and Carl's work. Emma Jung, the Atlas to Carl Jung's world. She held and steadied him, largely in silence and behind the scenes. She is the unsung hero who shared the brilliance and attention of her husband with the world. There is no doubt that there would be no Carl Jung without Emma. The world owes her a debt of gratitude for the beautiful mark that he left upon it. The most eccentric personalities tend to also be the most unstable and without the right combination of an extremely stable personality to balanc Emma Jung, the Atlas to Carl Jung's world. She held and steadied him, largely in silence and behind the scenes. She is the unsung hero who shared the brilliance and attention of her husband with the world. There is no doubt that there would be no Carl Jung without Emma. The world owes her a debt of gratitude for the beautiful mark that he left upon it. I do not often read non-fiction for pleasure but this was truly fascinating. What an interesting life! Using letters, interviews, and archived material, the author put together this story of Emma Jung and her influence on her husband and psychoanalysis. She was a very bright woman and the stabilizer that her husband Carl needed. It is doubtful he would have accomplished what he did without her. Carl did give his wife credit and did not push her into the background as some other spouses of famous men have been. 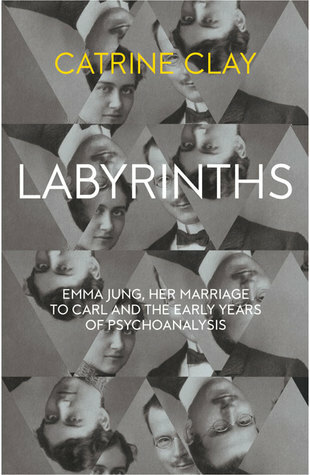 I would have liked to see more of Emma's story; this is as much about Carl as it is abou Using letters, interviews, and archived material, the author put together this story of Emma Jung and her influence on her husband and psychoanalysis. She was a very bright woman and the stabilizer that her husband Carl needed. It is doubtful he would have accomplished what he did without her. Carl did give his wife credit and did not push her into the background as some other spouses of famous men have been. I would have liked to see more of Emma's story; this is as much about Carl as it is about Emma. They had a strong marriage although Carl had many affairs and relationships with other women, even bringing them into his home and practice. At times the psychoanalysis portions and Carl's musings were over my head but I plowed through those to get to the rest of the story (e.g., Carl's pondering as a small child whether a stone he was holding was him or was he the stone). I found this to be a dry read--it did pick up at the end a bit when information shared from interviews with Emma and Carl's grandchildren was shared. I don't normally read non-fiction. I prefer fictionalized biographies, but Labyrinths by Catrine Clay was entirely entertaining and well worth reading. It is obvious the author conducted in-depth research into Emma's life, drawing from personal letters, diaries, and articles of the time. Together, she gives us an intimate glimpse into the turbulent life of this famous couple. I also learned a great deal about psychoanalysis and the interpretation of dreams, a subject that has always fascinated m I don't normally read non-fiction. I prefer fictionalized biographies, but Labyrinths by Catrine Clay was entirely entertaining and well worth reading. It is obvious the author conducted in-depth research into Emma's life, drawing from personal letters, diaries, and articles of the time. Together, she gives us an intimate glimpse into the turbulent life of this famous couple. I also learned a great deal about psychoanalysis and the interpretation of dreams, a subject that has always fascinated me. Great introduction to Emma Jung and her work, her place in the early days of psychoanalysis. I got a slightly better hold on Jung also, as I read. He did not make things easy for Emma Jung. Rather, the reverse. He relied all his life on the strength and stability of his marriage to Emma. It gave him the courage to deal with his own inner "personality no. 2" which troubled him so much, and because of which he was able to go deeply into his studies. Most interesting and informative read. I have such admiration for Emma Jung. Writing is journalistic rather than telling a story of their lives.